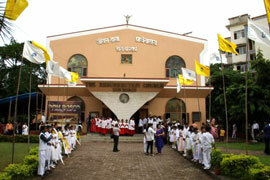 AUGUST 11, 2011: Vasai’s love affair with Don Bosco goes back many decades. Although it is only the recent years that have seen Salesian institutions being established in this region, Don Bosco has been a household name in Vasai for the past few generations. So great is the fascination for Don Bosco in this quaint suburb of Mumbai, that when Vasai did not feature on the original itinerary drawn up for the pilgrim Relic, Archbishop Felix Machado of Vasai personally requested that the Saint’s Relic should be brought to his diocese. 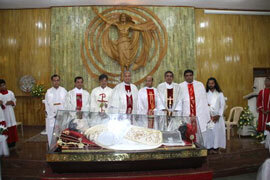 “Vasai has great devotion to Don Bosco, it is unthinkable that he will not be visiting us,” the good Archbishop had insisted. On August 11, the appointed day for Vasai’s tryst with Don Bosco, the town was abuzz with excitement from the wee hours of the morning. At 6.30 a.m., when the vehicle carrying the casket with the Relic approached the railway-crossing at Virar, the crowd of students and devotees gathered there broke out into a roar of ecstatic applause. They then accompanied the casket in procession to Resurrection Church, Virar East, with the Don Bosco School, Naigaon band playing along. 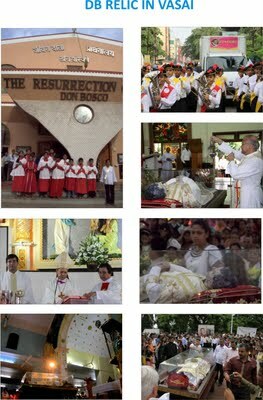 The Church was already packed with parishioners and devotees, who had come to venerate the Relic and seek the blessings of Don Bosco. At 8.00 a.m. the Eucharist was celebrated, with the Parish Priest Fr. Lawrence D’Souza being the principal celebrant. A visibly moved Fr. D’Souza reminded the gathering that they were privileged to received such a singular grace. “Having the Relic of Don Bosco with us here in Virar is an extraordinary blessing, an event that we can never forget,” said an emotional Fr. D’Souza. The next stop for the day was St. James Church in Agashi. The Relic was once again taken in triumphant procession from Virar to Agashi, led by a motorcade of youth on their motorcycles, waving flags and raising slogans in honour of Don Bosco. At 10.30 a.m. the Relic arrived at Agashi and was immediately kept open for public veneration since a huge crowd of devotees had already gathered. As the minutes ticked by, the crowds began to swell rapidly, giving rise to fears of a possible stampede. Even the Eucharistic celebration had to be delayed since the stream of devotees kept pouring in and the atmosphere in the Church was highly charged with emotion and fervour. 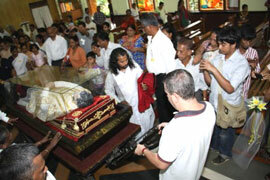 At 3.00 p.m. the Relic departed from Agashi for the Cathedral of Our Lady of Grace at Papdy. This time the procession was led by a motorcade of past pupils, who had turned up in huge numbers. With the band playing jubilantly and the entire crowd singing ‘Raise Your Voices’, the Relic was solemnly ushered into the Cathedral. The grand Eucharistic celebration at 6.30 p.m. had Archbishop Felix Machado as the principal celebrant, with about fifty other priests concelebrating. Not just the Church, but even the adjoining school grounds were filled to capacity by the massive crowd that was present for the celebration. Quoting extensively from the writing of Don Bosco, the Archbishop in his homily spoke on the attitudes and the approach we should have in dealing with youth. “Youth are a precious part of our society,” the Archbishop pointed out, “and we need to learn from Don Bosco how to help them grow into good Christians and honest citizens, so that they can be the future pillars of the Church and the society.” After the Mass, public veneration of the Relic carried on till 10.00 p.m.
A significant event of the day was the launching of the Salesian Cooperators Movement in Vasai. Fifteen past pupils of different Salesian institutions got together to officially begin the first unit of Salesian Cooperators in Vasai, on the occasion of Don Bosco’s visit to this area. “The past pupils did a splendid job in organizing the entire day and they were really overjoyed to have the Relic in Vasai,” said Fr. Wilfred D’Souza Provincial Delegate for the Salesian Family. “The initiative to form this unit of the Salesian Cooperators came from the past pupils and it certainly was a fitting event to mark this memorable day,” added Fr. D’Souza. The Relic has already left Vasai, but the Salesians and the Salesian Family will continue to keep alive the legacy and mission of Don Bosco in Vasai – a land where the people are passionately in love with this great saint!